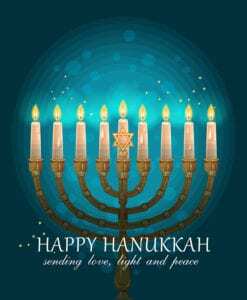 Chanukah is the Jewish eight-day wintertime, “festival of lights.” Hanukah is a holiday that commemorates the rededication of the second temple in Jerusalem at the time of the Maccabean revolt against the Seleucid empire. The holy land was ruled by the Seleucids (Syrian-Greeks), who attempted to force the people of Israel to accept and adopt Greek culture and beliefs for their own. Against all odds, a small group of Jews, led by Judah the Maccabee, defeated the mightiest army, drove out the Greeks from their land, and reclaimed the holy temple in Jerusalem. When they tried to light the temple’s lights (a menorah which was a seven-branch candelabrum), they found only a single cruse of olive oil. They lit the menorah and miraculously, the little one-day supply lasted eight days. To commemorate this miracle, the sages instituted the festival of Chanukah. The menorah holds nine flames, one of which is called the “Shamash,” which is used to light the other eight lights (candles). On the first night one candle is lit, on the second and additional candle is lit, until the eighth night all the candles are lit. Special blessings are recited and sung, special foods are eaten, and games are played. Chanukah begins Sunday night, December 2, 2018 and continues through Monday, December 10, 2018.